Think you know Chicago? Look closer. The marvelous miniatures of Wonderland Express reunite with their iconic Chicago landmarks for the holidays! Below are six of the most popular of our 80+ replicas alongside their real-world landmarks for comparison. Created by Applied Imagination for our holiday and model train exhibition and photographed by staff photographer Robin Carlson, each model building is created in detail using only botanical materials. Come see these models and more for yourself: Wonderland Express is open daily November 27, 2015–January 3, 2016. 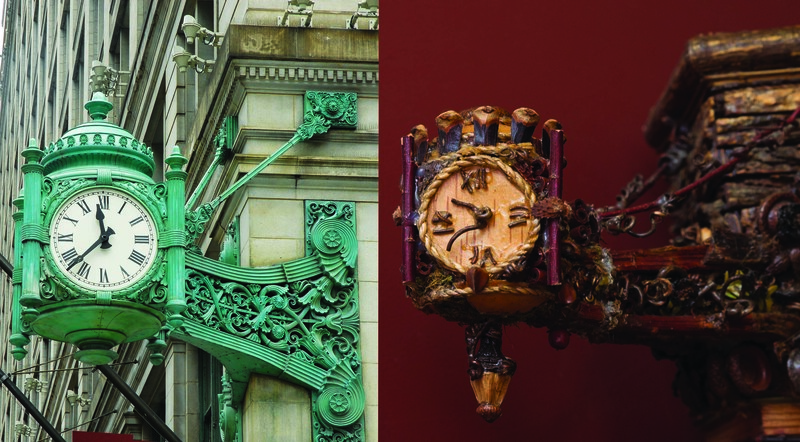 We couldn’t quite squeeze all the numbers onto the face of our 3-inch-high Marshall Field’s clock (now Macy’s). Look closely at the 7½-ton, bronze original, and you’ll see that the Roman numeral “four” is represented as IIII rather than IV. In 1998, more than 100 years of city soot was washed from the darkened exterior of the Newberry Library, revealing its original 1893 surface of Connecticut pink granite. Called “the Wonder Theatre of the World” in 1921, the Chicago Theatre is a landmark loaded with other landmark references: the arch over the glitzy marquee is modeled after the Arc de Triomphe in Paris, the lobby after the Royal Chapel at Versailles, and the grand staircase after the one in the Paris Opera House. More than 100 seedpods stand in for the more than 100 statues that decorate the exterior of the University of Chicago’s Rockefeller Memorial Chapel. Built almost entirely of stone, the real thing weighs a staggering 32,000 tons; our model, about 20 pounds. Wonderland Express is a 10,000-square-foot holiday-themed exhibition that’s become a family-friendly tradition at the Chicago Botanic Garden. Model trains travel over bridges, under trestles, and past waterfalls on their way through a magical landscape with more than 80 mini-replicas of Chicago-area landmarks, all created with natural materials. 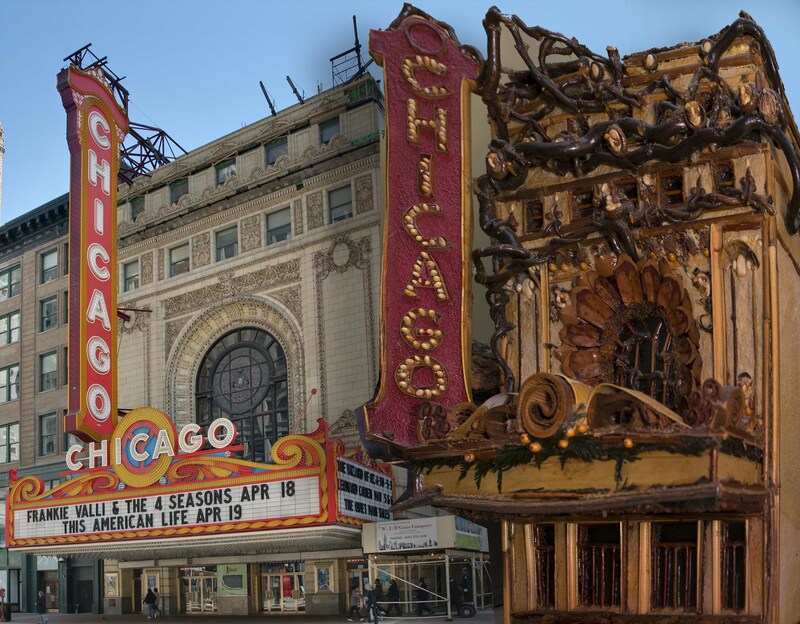 Posted on November 19, 2015 Author Karen Z.Categories Wonderland ExpressTags chicago landmarks, chicago landmarks quiz, Chicago Stadium, Chicago Theatre, Marshall Field clock, miniature chicago, Newberry Library, Rockefeller Memorial Chapel, Sears Tower, United Center, Willis Tower, wonderland expressLeave a comment on Think you know Chicago? Look closer.